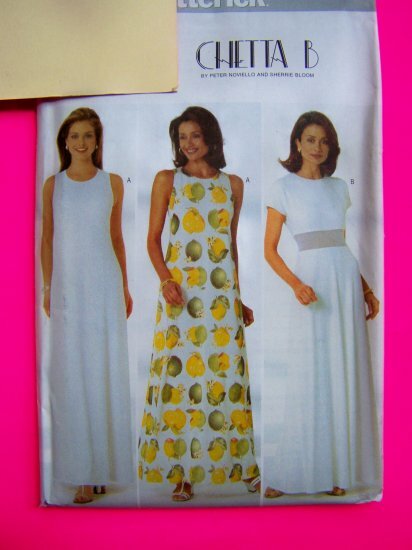 1997 Butterick Chetta B sewing pattern # 4916. Misses sizes 6 - 8 - 10 - 12. Simple but elegant long evening gown is close fitting, slightly flared or flared, lined dress, evening length, has back zipper. View A is sleeveless. B self lined bodice, contrast inset, and cap sleeves. Holiday parties are right around the corner! More formal, evening, cocktail and party dresses in new and vintage sewing patterns listed.By Peter Noviello and Sherrie Bloom. Measurements: Bust 30 1/2 - 34". Waist 23 - 26 1/2". Hip 32 1/2 - 36". S & H to the USA is $2.00 and $1.00 for an additional sewing pattern.